One of the most important and complex works by two-time Palme d'Or winning director Shohei Imamura, A MAN VANISHES begins as an investigation into one of the thousands of missing persons cases that occur in Japan each year. The film follows the case of Tadashi, a handsome businessman who has suddenly vanished. 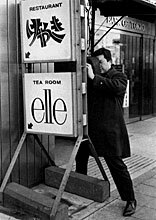 Imamura and his crew interview the man's fiancee, Yoshie, who is desperately searching for him, and the filmmaker becomes increasingly involved in her life. But the "investigation" casts a shadow of doubt over the couple's relationship, Tadashi's business ventures, his relationship with Yoshie's sister, and even the investigating film director, Imamura himself, who may not be what he seems. Radical film in scope, technique, and aesthetic, A MAN VANISHES distills many of Imamura's central themes and obsessions, the film culminating a stunning sequence that explodes any stable sense of fiction and reality.